10 Carolina Spirit Quest, Inc.
30 LoYo On The Go! We have an amazing diversity of vendors registered this year, selling products and services that range from jewelry, to henna, to reiki, to festive and ritual clothing. Register online to be a vendor at the 2013 event! Any Witch Way in Concord, NC carries: candles, incense, essential and fragrance oils, ritual supplies, smudging supplies, quills and inks, wax seals, books, tarot cards, necklaces, tapestries, statuary, cauldrons, pendulums, runes, wind chimes, bumper stickers, art prints, over 150 herbs, plus much more! We are also opening an online store! Darrell will be presenting Astrological Astrocartograpy Maps that reveal cities and states that are favorable or unfavorable for all areas of life. Hand-forged items, wire-work, grapevine wreaths, and other small crafts. Select crocheted items from On Heather's Hook will also be available. Black Wolf Trading is a Pagan Shop offering Art, Crafts, and Tarot reading. Our art work is a wide selection of Pagan artwork by lady Clay Feather and Travis Edmundson. We also offer handmade crafts from candles to leather barrels. Travis will be doing Tarot card readings. Handmade raku fired ceramic miniatures incorporated into miniature landscape terrariums. Handmade raku fired ceramic jewelry. All displayed on our handmade gypsy cart! Handmade Jewelry! A wide variety of handcrafted pendulums, earrings, rosaries, meditation stones, necklaces and bracelets. Also dream and headache pillows. Charming Bear Gifts sells a variety of items including wind chimes, sterling silver jewelry, incense, leather embossed journals, crystals, etc. We look forward to seeing you. Handmade crochet items. The amigurumi style charms are great for keychains and backpacks. come in several animals with owls the most popular. The purses come in a variety of sizes and styles including my most popular cat purse. The selection is rounded out with felted wool purses. The hats range in sizes and include caps, tams, and wide earmuff headbands. Handmade-one of a kind semi-gemstone jewelry-necklaces,bracelets,and earrings. Pressed flowers as bookmarks, greeting cards and pictures from my own garden. Designed and handmade purses,wallets, IPad holders, I-phone holders, bags of re-cycled materials, cross-body bags, stuffed owls, silk pillows, cosmetic bags, and wristlets. Original Hand crafted crocheted items, special orders accepted. Hand woven brooms with and without handles, altar brooms. Hand carved bowls, incense burners, wooden spoons. Hand crafted wands. All are made from gifted wood. I am adding handspun wool this year, a new skill I am excited to share. Your source for symbolic Celtic and celestial jewelry and gifts. Celebrate special moments with WWW.EARTHTRADITIONS.COM. Gemstone and Sterling jewelery, quartz crystals and other gemstones. Handmade wands, at least 16 woods to choose from.Wand cases and mojo bags.Handmadebesoms.baby besoms are back! This year we have etched glass also! Come find what you need! Eclectic Pyrography, Handmade Jewelry and Recycled Goodies! Unique & Functional pyrographic art, Handmade Beads and Jewelry, plus lots of Re-purposed Crafts and Oddities from a NC born artist and her family. Also, Dream Gongs will be back in the booth for all of your sonic needs! I display my pieces on tables and shelves.Wall hangings, leaf vases and bowls are hand built using stoneware clay slabs. The wall hangings are sculptured faces, leaves and cut outs. Some of the surfaces are decorated using texture, under glaze and spray glaze. HammerSol Jewelry is a husband and wife team of metalsmiths. We have over 20 years of combined experience working with precious metals. Our original Norse inspired jewelry is created through the techniques of lost wax casting, chasing and repousse, and cloisonne enameling. Enter into the land of all things whimsical! Where imaginary meets everyday life. We provide handmade Faeiries Magic and woodland extras to suit your flights of fancy. One of a kind body art and hula hoops of all sizes. Fairly traded, handmade, organic clothing from Nepal and India. All sizes to include 3X. Animal hats, hobo bags and backpacks, scarves, mittens and coin purses, pens and wands. Lovingly created and magickally infused cloaks, robes, jewelry, art, and crafts. Blessed be. A wide range of Pagan items, including t-shirts, books, flags and banners,signs, tapestries, leather goods, assorted household decorative items, many of which are handcrafted, and Waltlons All Natural Products. You never know what treasures you will find here. Cauldrons, journals, incense, tote, bags, banners, sarongs, jewelry, bells, tarot cards, wooden boxes, altar items, and MORE! Mystic Serenity sells metaphysical and pagan items such as pyramids, chakra balancers, selected crystal and rock specimens, pendulums, figurines, mortar and pestles, wall hangings, wands, and much more. Artisan & retailer of Sculpted precious metal wire jewelry of pendants,earring, bracellets, rings of Sterling Silver, 14kt., Copper, Aluminum. Handcrafted draw-string bags. Also, crystalline and carved mineral gift items. Pagan Haven is a social network of solitary witches in the Jacksonville area. The MYST helps fund events and field trips, and consists of gently used altar items, books, and art made by our members. Questionable Decor, Possible Art, & Primitive Bling. Wearables, Hairables, Ritual Tools & Accouterments, Rocks & Fossils, Books by Miles Batty*, Random Weirdness. Miles will be tethered to a convenient tree for book signing and questions on Sunday. Raw crystals and minerals, handmade jewelry, Shipibo textiles and artwork. I special in crocheting fantasy amigurumi animals. I make dragons, faeries, cthulhu, and so much more! I also do many custom orders. Give me a pattern or an idea and I'll make it! Sew Evil offers custom-made gothic, rockabilly, punk, fetish, steampunk, ritual, pagan, renaissance, and faerie wear. We have clothing, accessories, handbags, jewelry, gifts, and custom embroidery items. Beaded jewelry and handmade incense. Hand-painted coats of arms, family name histories, and hand-made Celtic Art products. Come visit the Silver Sisters Cottage. We have woodworking, altar boxes, jewelry, cloaks, bellydancing outfits, Books of Shadows, books, cauldrons, tarot, COS fairys, statuary and much more. We offer handcrafted altar supplies, including altar cloths, incense bowls and athames at reasonable prices. From ritual-wear to everyday cloaks, we have something for everyone. When looking for that special something Sosanna's Closet is the place to go. Custom work is always available. We are a small family farm in Hillsborough that strives to farm in a way that is healthy for our land, our family, our animals, and our community. 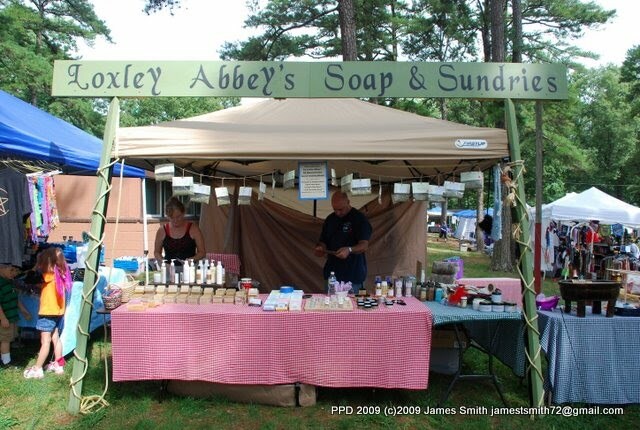 We make luxurious all-natural goat milk soaps and shampoos, enameled glass art, gourmet jams and jellies, and more. To learn more about us, please visit our website. Tarot readings by Sam Quick and Nokimoon's Creations including Runes, bags, tails and more. Sterling silver pentacles, rings, charms, chains, handmade stone charms, pewter metaphysical charms and bracelets, dragon jewelry, stainless steel jewelry as well. All high quality - even offering nickel-free silver as well. Egyptian charms and newly offered statues. Baphomet statues! Egyptian statues and Celtic pendants as well. Thaumaturgy 777 is a distinctive “Full Service & Supply Occult Shop”. We offer readings (Tarot, Astrology & Geomancy), Organic Herbs, Magickal Oils, Ritual Candles, Bath Mixes, Teas, Incense, Books, Jewelry & much more! We also offer magickal services (spell work) on a case by case basis. Our shop is at 2618 Hillsborough Rd in Durham, NC. We carry a wide array of items to equip your less-traveled paths. Books, Bumper Stickers, T-shirts, statuary, drums, singing bowls, silk wrap skirts, ritual-wear and spiritual supplies! All handmade goods including Thor's hammers, Norse and Rune jewelry, Baltic amber, jet, and other gemstone jewelry, wooden boxes, runesets and drinking horns. Handcrafted flutes from wood and bamboo, hand carved walking sticks, wood spirits, wooden and metal tongue drums, rhythm shakers and rattles. We also carry a full line of incense, smudges and smudging accessories. Handmade Irish and Celtic gifts for your home, altar and wedding! The Truely Unique Booth will be your All-Spiritual Stop. We are a General Pagan Store located in Wilson carrying what ever you need. Email us your list of herbs and we will deliver them to PPD just for you! Irresistible Crystals & Tantalizing Treasures...Turquoise Temple offers Exceptional Crystals, Pocket Stones, Hearts, Balls, & Wands- perfect for working with the Earth Element. We can’t wait to see old friends & meet new faces this year! Experience the magic of Henna Body Art ~ WendyMehndi is a gifted artist who creates beautiful body art before your eyes! Artful natural Henna Tattoos (temporary body art), Glitter Tattoos, and Sacred Face-painting. Come be adorned! Fantasy creatures have been spotted! Come visit White Hart Haunt for a variety of creatures, our Altar Guardians. We specialize in fantasy critters, so expect to see lots of unicorns, dragons, loch ness monsters, and more! We also offer custom orders you can pick up the following day. Handmade magickal arts and crafts including rune sets, jewelry, pagan rosaries, wish boxes, spirit dolls, and more! An eclectic blending of hoodoo and Celtic/Roman influenced magick! We are two women addicted to our craft. We knit and crochet nerdy things and fun gift ideas. We love making handmade gifts, and now we wish to share our love with YOU! Our product selection includes specialty dice bags in varying sizes, wine gift bags, scarves, and plush toys. We also take commissions if you would like something special!